Ranney had to wait over 10 months to get their hands back on Roselle Catholic. And it seemed it was well worth the wait. 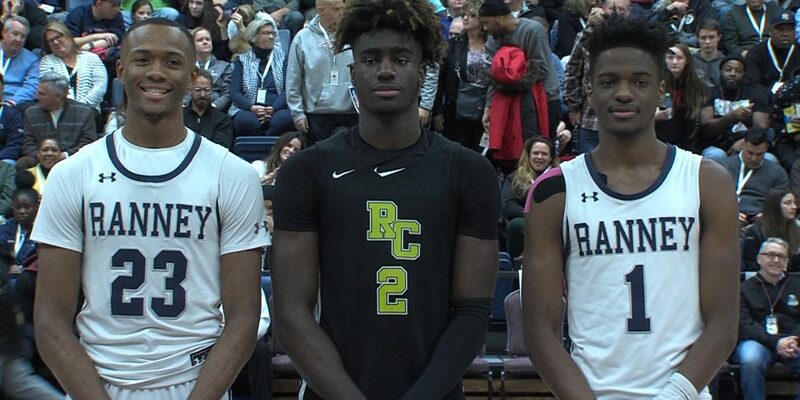 Ranney dismantled the Lions, 61-49, to get revenge from the Non-Public “B” loss dealt by Roselle Catholic last season, before a sold-out crowd at the Robert J. Collins Arena at Brookdale Community College. Villanova-commit Bryan Antoine led the way with 25 points in the win and also received MVP honors. Florida-commit Scottie Lewis was largely held in check but fell just short of a double-double with 8 points and 10 rebounds. The X-Factor, though, was junior Phil Wheeler, who scored 10 points, gathered 12 rebounds and dominated the paint in the 2nd half to help secure Ranney’s win. Roselle Catholic’s Kahlil Whitney, a Kentucky commit, scored 15 points and UNLV commit chipped in 13. Highly-touted junior prospect Cliff Omoruyi accounted for a double-double with 15 points and 10 rebounds, largely coming in the first half. It was one of the most anticipated regular season games in recent memory, considering three McDonald’s All-Americans (Whitney, Antoine and Lewis) suited up to play. Kentucky coach John Calipari was even in attendance to watch the spectacle.